Search for treasure deep within the twisting maze. The playing board constantly changes so no two games are ever the same. 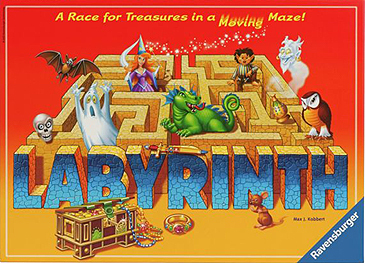 Labyrinth has won the hearts of millions for over 20 years. The cards will determine your quest. Looking for the dragon? How many routes can you take and also foil your opponents? Try to gain the advantage by inserting the extra tile to move walls and open passages of the Labyrinth. Block and advance is the strategy. The first player to reach all of their treasures wins.